It’s summer again. Apart from time for relaxing, it is also time for home repairing. If you are a home repair contractor, that could mean more projects for you to work on. However, don’t be too sure. If you can’t provide a quality service, the big profit that you might be expecting this summer could turn to cold and hard stone especially if not using the best rust remover in the market. Take what happened to one home contractor who got sued over rusting gutters, walls and water pipes. 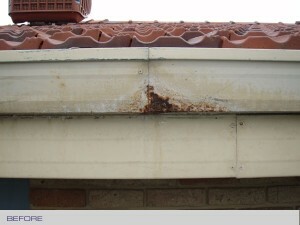 Days after his repair, already rust re-appeared on the house’s gutters and water pipes. Rust stains also were seen on the walls. With those, he was accused of being a fraud. And now, he and his business are being questioned. As a home repair constructor, surely, you wouldn’t want to experience the same thing. Financially, it will hurt you. And with how fast the words now spread it could put your business at the bottom of the heap. You could’ve been save by using a rust stain remover. The answer is pretty simple. Do a good job. With a repair service approved by your client, you can surely make a big profit. Additionally, it will bring in more customers. Now just imagine how many good things you can buy with it for your family? But then again, how can you make sure that your service will meet your client’s standard? One basic rule to follow is to use quality materials. Opting for cheaper supplies will definitely just put your work at risk. And if you are to repair metal items, better use Rusterizer. It could be toxic though, you might say. Well, the good news is that it isn’t toxic at all. As it has been earlier mentioned it is safe. And basically, the fact that is made of 100% organic ingredients is what make it risk-free. That speaks about posing no threat to the environment, to you as the user, and to anybody who gets in contact with it even to your pet. So if you want to earn more to provide your family’s every need, make your home projects effective. To do that, make sure that Rusterizer is in your materials and supplies list. It can effectively and safely get rid of rust, so rest assured that it is a great help.